Castle Creations makes the best electronic speed controllers in the industry, possibly the world! Our engineers have spent countless hours integrating features and firmware that no other manufacturers can match. Our Speed Controllers enabled with SmartSense use the motor’s sensors to provide smooth starts, excellent torque, and low-speed drivability. Once the motor is turning, it seamlessly transitions to Castle’s ULTRA-EFFICIENT sensorless mode with electronic timing. When running, a motor must transition between different load points and a different timing advance is required for optimal efficiency at each. Electronic timing in SMARTSENSE™ will advance timing automatically for peak performance during all driving conditions. This combines the best of both worlds in an unrivaled HYBRID between smooth sensored startups and high-efficiency sensorless running. Your motor will produce more power and less heat. Castle Engineers developed software features specifically for the crawler market called Synchronous Motor Drive. This feature allows crawler drivers to have complete control on inclines when going from forward to reverse and back to forward. Think of it like having a drag brake engaged at all times. So relax next time you're on a near vertical rock face...you're in control with Castle! Some of our newer speed controllers allow users to make on-the-fly adjustments through the AUX wire enabled in Castle Link. Once you have selected an AUX wire function, that setting can then be tuned from your transmitter while driving. Torque control, max throttle, max brake and drag brake adjustments are a sampling of the available modes. This real-time tuning allows you to quickly and easily fine-tune your system without having to end your run to make the changes. This feature captures and records performance data from your vehicle which allows you to view a detailed turn-by-turn record of what your ESC actually experienced during the run. You will be able to record real-time data such as motor RPM, battery current and voltage, ESC and motor temperature, throttle input, and more. Download and analyze the collected data via Castle Link and make adjustments to maximize both performance and battery life. Castle offers 4 different motor size families for a wide range of vehicle scale applications. The first two digits in our motor names refer to the diameter of the stator in inches, while the second two digits refer to the stator length. The size of motor you choose will depend upon the size of your vehicle, the drivetrain (2wd/4wd) and how much it weighs. Our 08 series motors are great for small 1:18th scale buggies, trucks and on road cars. Our 14 series motors are offered in the widest range of rpm and motor length for 1:10th scale vehicles. The longer the motor, the more torque it has. A 1415 is our longest 14 series while the 1406 is our shortest with the 1410 landing right in the middle. 1:10th scale vehicles vary greatly in size and weight so pay close attention to the specs provided by both castle and the vehicle manufacturer. We have two 15 series lengths - 1512 and 1515 the longest of the two. 15 series motors are perfect for 1:8th scale buggies, truggies and monster trucks. The biggest of them all is the 2028 which is our only 20 series motor made for giant 1:5th scale buggies and monster trucks. Be careful, this motor is known for insane burnouts, backflips and jumping buildings! Thermal performance and power handling are two of the most important aspects of any motor design. Both of these were key design considerations for the engineering team at Castle during the development of our 1406 Sensored motor line. Near the end of our development, we designed and completed a series of tests that was a direct comparison of thermal performance between our 1406 Sensored motor and a number of competitor’s 2-pole modified 7.5T motors. The competitor’s motors were chosen because they represent a popular setup that is similar in Kv (or top speed) to the Castle 1406 4600 Sensored motor. In these tests, we used a motor dynamometer‎ (dyno) in order to simulate two real-world loads that these motors are likely to encounter during a typical run. We set up the dyno so that it held the output power of the motor at 200W and 300W for the two series of tests we performed. This means that through a 5-minute test the motor output a constant and equal amount of power. We did this because we wanted to make sure our test was a fair comparison of real-world loads and was not affected by slight differences in motor Kv or speed under load. The temperature of each motor was monitored throughout the test. Some of the motors tested have better or poorer thermal connection between the internals of the motor and the outside of the motor can. In order to keep the test fair we monitored the temperature of each motor on the motor coils directly. The motor coils are a good representation of how close the motor is to actual failure. In practice, most people measure the outside of the motor can because it is convenient. Temperatures on the outside of the motor can are always lower than those of the coils, often by more than 60ᵒF (33ᵒC). In the results you will notice the temperatures are higher than you would expect on the motor can, and this is why. After running this test on all of the motor samples, we averaged all of the competitor’s motors together into a single line to compare to the Castle 1406 Sensored motor. The test results were very definitive. The graph above shows a constant 200W power output. This would be representative of a very mildly geared race setup. As you can see, by the end of the 5-minute test, the competitor’s motor temperature (red line) increased much faster the Castle 1406 Sensored motor (green line). This means you can run longer without worrying about your motor temperature with the Castle motor. This also means that the Castle motor is more efficient, losing less power into wasted heat, and using less of your battery’s charge giving you a longer runtime. What happens when we add a few more teeth to the pinion? We wanted to find out, so we increased the power output to 300W to simulate a higher geared race setup. The results were even more dramatic. The competitor’s motors increased in temperature at over twice the rate of the Castle 1406 Sensored motor. The competitor’s motors could not even finish the test. At around 2 minutes into the test, the motors were near their failure temperature (300ᵒF/150ᵒC). At that point, we had to shut down the test and air out the testing facility. Meanwhile, the Castle 1406 Sensored motor was able to power through the entire 5-minute test and remained within acceptable temperature limits. In conclusion, the results of this test are clear. 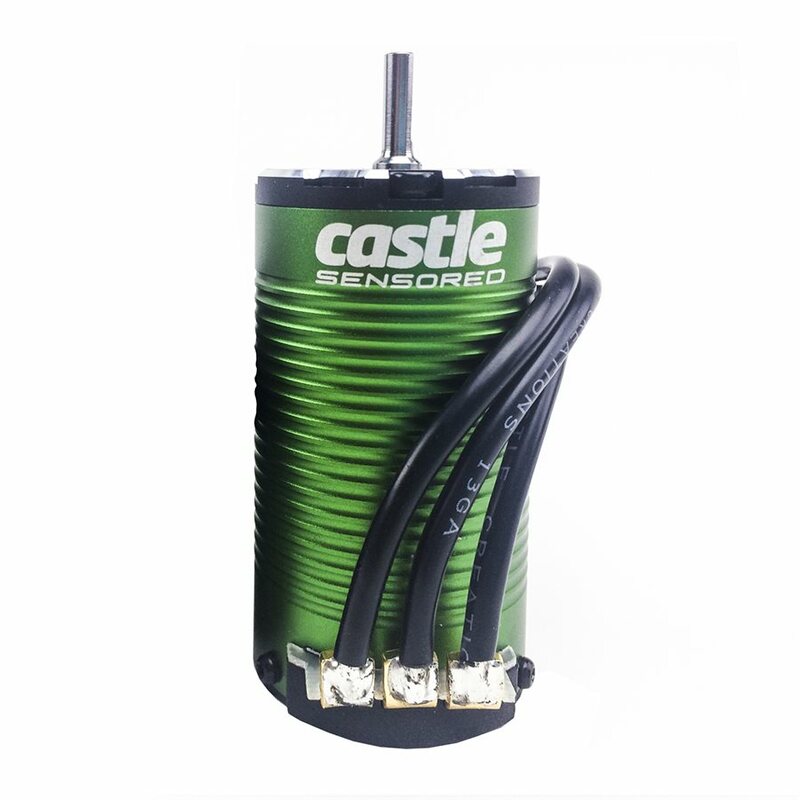 The Castle 1406 Sensored motor simply out-powers the competition. 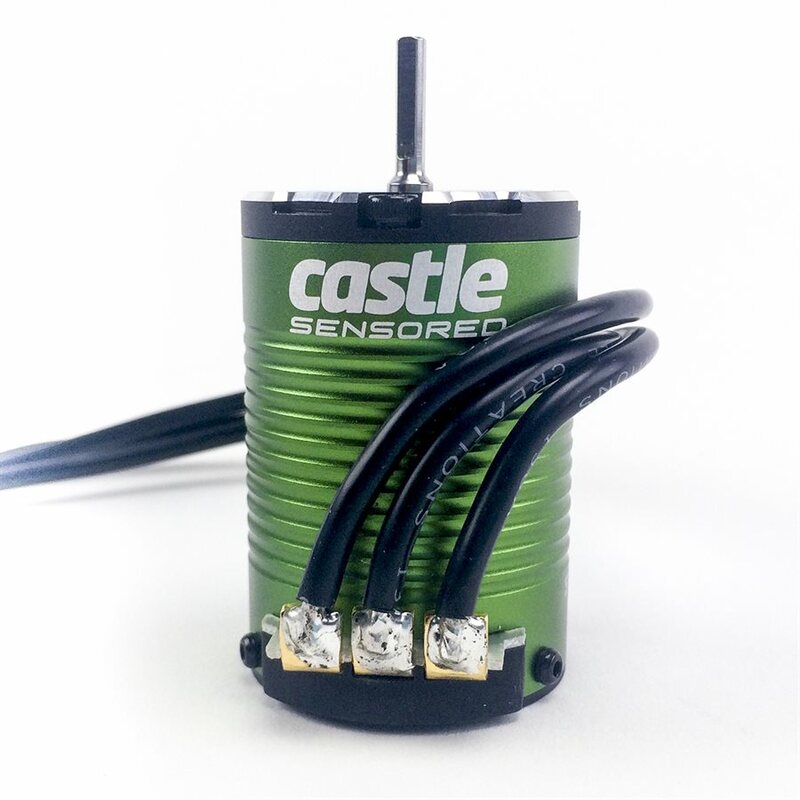 The Castle motor will allow you to gear your setup higher without overheating, generate more power for longer, give you more torque when you need it, and extend your battery life. Another example of Castle taking OVERPOWERING RC seriously. Brushless motor speed is measured in Kv which is how many revolutions per volt. For example, a 2S battery is 7.4 volts which means at full throttle, a 4600Kv motor would turn 34,040 RPMs. That same motor with a 3S battery would turn 51,060 RPMs. However, some hobbyists and manufacturers measure motor speed in turns which is a reference to the number of copper windings in the armature of a brushed motor. The lower the turns, the faster the RPMs. This chart shows how four of our Castle 4-POLE brushless motors compare to 11 different 2-POLE motors. Castle offers computer software which allows you to connect your Castle Speed Controller to a computer and customize the power settings. As you can see in the chart, one Castle motor is capable of similar performance to at least four 2-POLE motors. That's versatility!